The meaning of “confrontation” is the hostile disagreement face-to-face resulting from a clash of ideas or opinions. Sometimes we feel so battered by outside circumstances that we have no control over. Many of us feel so beaten down by life itself at different intervals. This happens in marriage many times when we feel like we can’t seem to communicate with understanding to our spouse. It is so easy to fall into depression when we feel that there is no way out. If we fall into the self-preservation mode, we have now cut ourselves off from the people who can help us. Let’s look at some of the pitfall of confrontation so that we do not make the mistakes other marriages have made. Statistics show that 96% of the time, you can predict the outcome of a conversation based on the first 3 minutes of the 15 minute interaction. If you begin a conversation with harsh speech, you are doomed for failure. 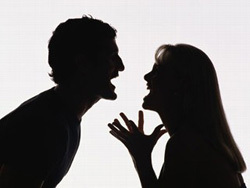 Negative interactions are lethal to a marriage relationship. A complaint only addresses the specific action at which your spouse failed. A criticism is more global—it adds on some negative words about your mate’s character or personality. Sarcasm and cynicism are types of contempt. This is poisonous to a relationship because it conveys disgust. When conversations become so negative, critical and attacking, you will end up defending yourself. In marriages where criticism and contempt lead to defensiveness, which leads to more contempt and defensiveness, eventually one partner tunes out. This behavior is far more common among men. Any of the above actions, will cause confrontation. In this verse we see how Job is so upset that he is boiling on the inside and can find no rest. This is exactly what happens to you and I when we enter a conversation harshly. Here are three goals that we must use before we start a conversation that is very controversial. First, use HUMILITY. 1Pet.5:5 “…God resists the proud, but gives grace to the humble.” This is a must in a controversial conversation. Don’t go into the conversation with the attitude that you will get everything your way. Make it a WIN-WIN situation. That is where you will be able to have some things your way but be flexible enough to allow his concerns to be taken care of also. Your spouse talks, while you listen. The secret to good communication is listening. Listening and talking at the same time guarantees that you are going to miss important facts and details. Win the “first place” position for listening. To be a good “helpmate” you need to know his opinion and position. Communication is a prerequisite to success. God has good plans for your marriage. He knows what you need and he lovingly provides it for you. Do not withdraw from God in the middle of distress and confrontation. His helping hands want to help you in the time of need.